From the window of the airplane you see only the tips of the snowcapped volcanoes of the Aleutian Island archipelago. The islands are skirted with a thick fog created by the warm air off the Pacific mixing with the cooler air off the Bering Sea. This is summer in the Aleutians. Gone are the hurricane force winds and rough seas of winter. The balmy weather signals the breeding season for many marine mammals in Alaska, and a new field season for wildlife biologists from NOAA’s Alaska Fisheries Science Center (AFSC). Their mission is to find clues that explain the continued decline of the westernmost portion of the Western stock of the endangered Steller sea lions. Stella, the hexacopter, awaiting test flight. Preparing and setup for hexacopter test flight operations. 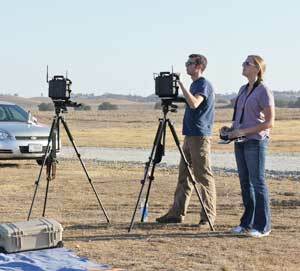 Katie Sweeney piloting hexacopter during test flight with Van Helker assisting. Aerial surveys, using a NOAA Twin Otter airplane, are the best way to annually monitor the abundance and productivity of these animals. But for the last six years the weather has not cooperated. To get population counts below the fog, scientists have been forced to think innovatively. 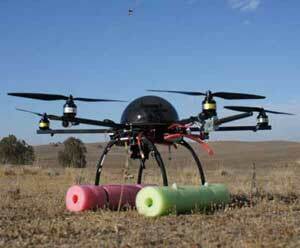 The answer may be in using an unmanned aircraft like a hexacopter. A hexacopter looks like an insect from a science fiction novel, a mutant flying spider. The abdomen, or center of the hexacopter, is a circular dome about a half-foot in diameter. Six arms extend a foot from the abdomen and end with a ten-inch rotor blade. Two legs form the landing gear. Each leg is encircled with brightly colored foam tubes, like those found near a pool, for a soft landing. The total diameter across the hexacopter, blade tip to blade tip, is about three feet. The hexacopter is piloted from the ground or a vessel’s deck using a console with joysticks, a small monitor, and various switches and knobs. 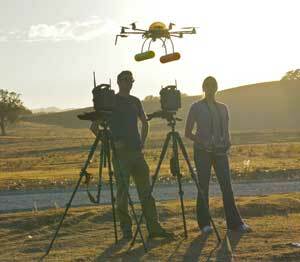 “We don’t like to call it a drone…we call ours Stella.” says Katie Sweeney, one of a handful of U.S. Federal Aviation Administration (FAA) certified hexacopter pilots in NOAA. This summer Fritz and Sweeney will be heading to the Aleutians aboard the USFWS Tiĝlâx, a U.S. Fish and Wildlife Service vessel, with a crew of other scientists to conduct Stella’s first scientific mission. The goal is to fly over 16 high priority sites in the Western Aleutians and photograph newborn pups, juveniles, and adults. Eight sites are between Kiska and Amchitka Islands (177°E-180°) and have not been surveyed since 2008. 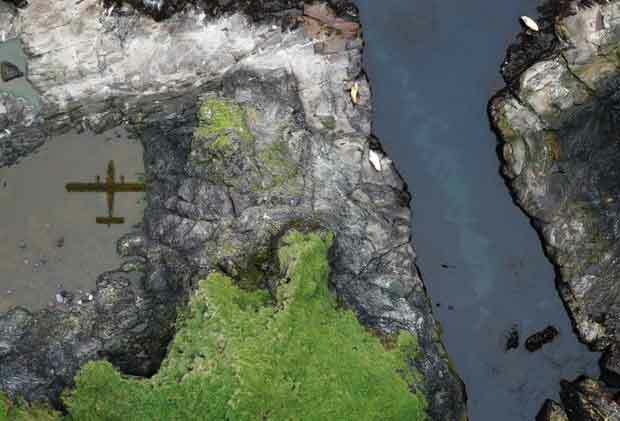 Another eight sites are in the Delarof Islands (180°-178°W) and have not been surveyed since 2010. Before Stella could fly there were many hoops the scientists had to go through. To fly an unmanned aircraft for government research, Sweeney and colleague LTJG Van Helker, from the NOAA Corps, had to satisfy multiple criteria required by the FAA. Unlike the Twin Otter airplane, Stella can fly as low as 150 ft (the Twin Otter remains at about 750 ft) over survey sites in remote areas far from an airfield and near tall cliffs. Another virtue of the hexacopter is that it is much quieter than a Twin Otter. Fewer animals will get spooked and dive into the water, allowing scientists to get more accurate estimates of population abundance and images of permanently marked animals to gather life history information. The hexacopter may sound like a better option than the Twin Otter, but it is expensive and less efficient. It needs a vessel, like the USFWS Tiĝlâx, to bring it close to the islands for successful deployment, and it can cover only about two sites per day. A Twin Otter, on the other hand, can survey dozens of sites in a couple of hours when conditions are favorable. The skies over the Aleutian Islands won’t likely see an air force of hexacopters flying around in the name of science. But, this summer, one lone hexacopter named Stella will be flying below the fog in the western Aleutian Islands to help solve the mystery behind the decline of Steller sea lions. By Rebecca Reuter, with contributions from Dr. Tom Gelatt, Lowell Fritz, Katherine Sweeny, and Van Helker. Learn how the hexacopter was successfully used by scientists at the NOAA Southwest Fisheries Science Center to study penguins, leopard seals, and Antarctic fur seals in the Antarctic.